Five Indonesian airports, including those in Bali and Lombok, were closed yesterday after Mount Raung's eruption blanketed the sky over eastern Java with ash clouds, disrupting flights and leaving thousands stranded across the country. The Transport Ministry ordered the airports closed until 9.30pm, but the two airports in Lombok reopened yesterday afternoon. Some 316 flights were affected, said airport operator Angkasa Pura I. National carrier Garuda, the worst affected, cancelled 112 flights while other airlines, like Lion Air and AirAsia Indonesia, did the same. Malaysia Airlines cancelled all flights to and from Bali. Singapore Airlines cancelled 10 flights to and from Bali, while four SIA flights today will be delayed. The airport closures and flight cancellations came a day after Australian low-cost carriers Jetstar and Virgin Australia cancelled all flights between Australia and Bali. A Straits Times check with Changi Airport Group found that 32 flights to and from Bali were affected yesterday. Some flights were cancelled, others re-timed or delayed. The Transport Ministry's director of Air Navigation, Mr Noviriyanto Rahardjo, said his ministry ordered the five airports closed for safety reasons. Volcanic ash can damage jet engines. Meteorologists said winds were blowing the ash from Mount Raung in East Java province south-east towards Bali's international airport, Lombok's international airport, Selaparang domestic airport, and the Jember and Banyuwangi airports. "We have instructed airlines to inform their passengers, to avoid overcrowding at airports," Mr Rahardjo said. Some 3,000 passengers are believed to be stranded in Bali. The disruptions are the worst since volcanic eruptions started late last month, and come as millions start to travel home for next week's Idul Fitri celebrations. There were chaotic scenes at Jakarta's Soekarno-Hatta airport yesterday as airline staff walked around with placards informing passengers of the cancelled flights, and long queues of people asked for refunds or to reschedule their flights. "We came in overnight to transit for a few hours, but now we are told the flight to Bali has been cancelled. We want to cancel our hotel stay for tonight, but we also do not know how long we will be in Jakarta," said a frustrated Belgian tourist. Another traveller, Mr Peter Skalberg, was supposed to meet his wife and daughter, who travelled from Singapore, in Bali. "I don't know when I can join them," said Mr Skalberg, who works in an advertising agency in Singapore and makes business trips to Jakarta occasionally. Garuda and Lion Air are offering refunds to passengers affected by the flight disruptions so far. The Indonesian authorities say they will review conditions daily. Mount Raung's alert status has been raised since it erupted late last month. 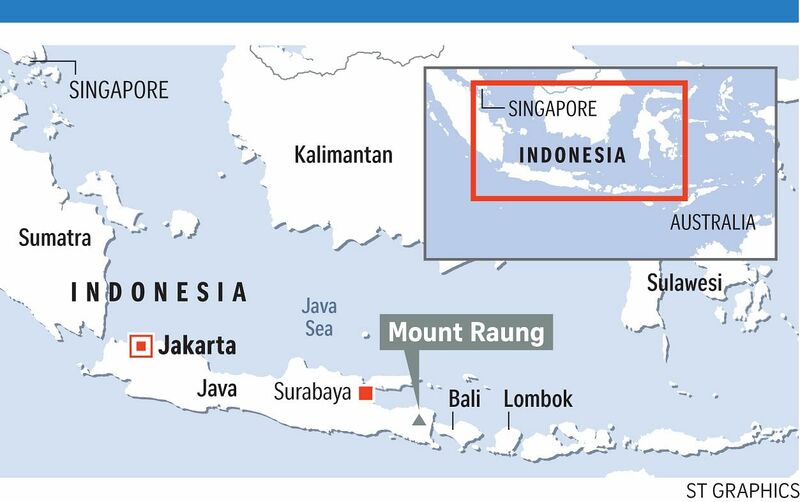 Indonesia has about 130 active volcanos and sits on the Pacific Ring of Fire, a seismic belt that makes it prone to earthquakes and volcanic activity.